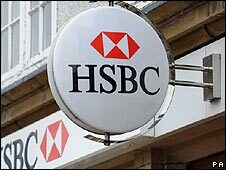 Banking giant HSBC is to axe 1,100 jobs worldwide, blaming the current financial turmoil for the decision. About half of the cuts, which will affect back room jobs at its global banking and markets operation, will take place in the UK. HSBC employs about 335,000 people around the world. Last month, HSBC said half year profits fell 28% to $10.2bn (£5.2bn), as it was forced to write-off $14bn from bad debts in the US and asset write-downs. Meanwhile, pre-tax profits fell 35% to $2.1bn during the same period. An HSBC spokesman said the firm had opted to reduce its workforce, "because of market conditions and the economic environment, and our cautious outlook for 2009". Many of the job-losses will be at the headquarters of HSBC's investment banking division, which are in London's Canary Wharf. Banks around the world have been coming under increased pressure from the credit crisis currently affecting financial markets. The problems have forced governments to step in and boost money markets as well as bail out a number of companies. Earlier this year, the UK government had to buy mortgage lender Northern Rock, while in the US lenders Fannie Mae and Freddie Mac have been rescued as well as insurer AIG and investment bank Lehman Brothers filed for bankruptcy.